For every project I need to finish, it seems as if I've started two more in the last few months. Been listening to audio books and knitting, cooking, painting, crocheting and thinking about more and more projects! 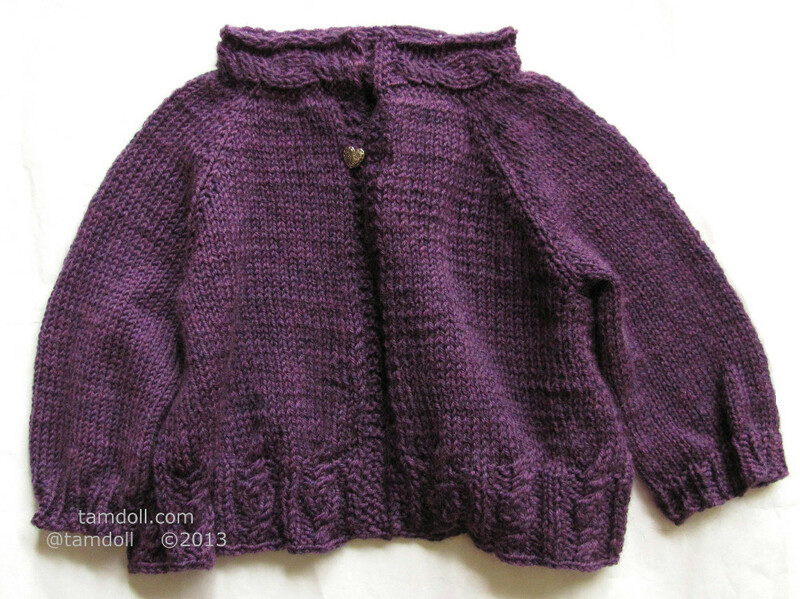 Sweater pattern is Candy Twist from Petite Purls, and it knit up fairly quickly. If a child's sweater wasn't so time-sensitive (as they grow so fast), I don't think I'd have gotten it done by now. Before finding this pattern, I had started a few others, ripped them out and started over and over again until I found the yarn and pattern combination I liked the best. If anyone out there knows of cute toddler sized patterns, I'd appreciate a recommendation! Here's my link to the project on Ravelry. When I started listening to audio books, I never imagined I'd get so hooked. Mostly I download them from the library, and they keep me company in the car, at the gym, while I'm cooking and cleaning around the house. If I don't have to pay attention to the stitches too carefully, I can listen to a book and knit - it definitely makes the time fly! Lately I've been hooked on Young Adult books, they're really entertaining. Honestly, I don't think I'd go to the gym as often as I do if I didn't listen to them. What I'm listening to now: "The Alchemyst: The Secrets of the Immortal Nicholas Flamel " (amazon affiliate link). If you're on Goodreads, I'm tamdoll. I've found it's a great place to keep track of books I'm reading and what I want to read next. (I used to keep a notebook, but this makes titles much easier to search and I can add books to my lists when I'm mobile, too.) I love books. If I had more time in a day, I'd spend it reading. Fantasy has always been my favorite genre and ever since I started trying to keep up with the books my kids are reading, I've been devouring the dystopian fiction titles I find in the YA section of the library or bookstore. What about you? Have any favorite books/genres? What an adorable sweater...love the color too! And a great idea to listen to audio books while you work. I can see how that would make the time fly! I like your present state of mind - let the projects simply come when they are ready. Always a good way to go. Sending you a big crafty hug! Very Cool sweater. I am just amazed that you can make something so amazing with needles and yarn. I envy that. I can do a lot of crafty things but crochet & knitting not one of them. Props. 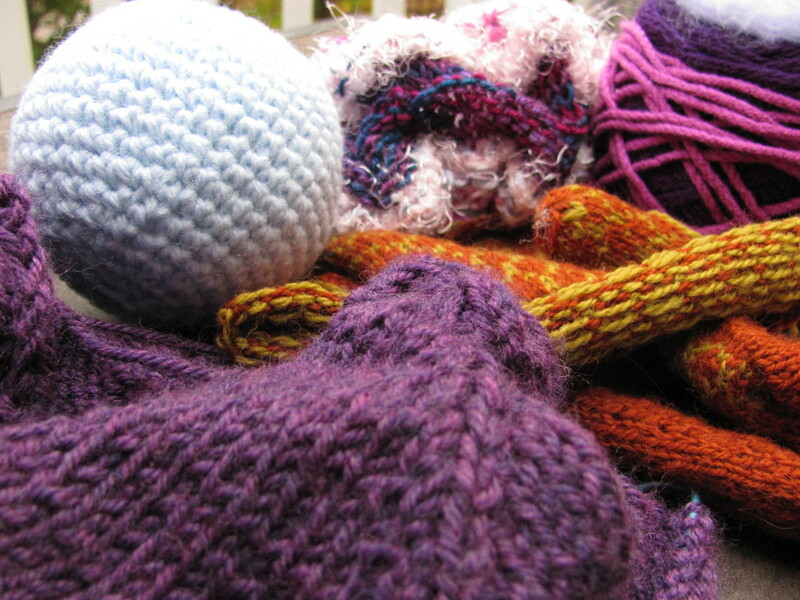 thanks for stopping by the old neglected blog today...sending crafty vibes and hugs your way/. I like listening to books on tape too. It's a great way to multitask. Currently I'm reading Walden and Becoming Sister Wives. I know, it's an odd combination. The purple sweater is really cute. I like the cable detail on the neck. Thanks Jessica! I am gearing up the courage to make a grownup sweater soon, haven't done one in a while. That is certainly an eclectic mix of books. Well, they're both about living harmoniously in a way, right? I'm still on the YA track - they're easy listening & if I miss something while I'm knitting, it's not a big loss. At least not the ones I'm choosing these days.